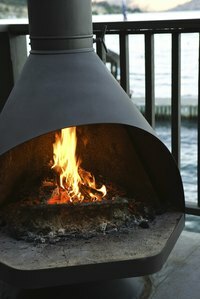 Wood fire pits are outdoor fireplaces that provide the warmth, beauty and ambiance of a conventional campfire without risk of the fire spreading or becoming uncontrollable. They are available in many sizes and shapes and made from a variety of materials. Many fire pits are made from copper and stainless steel. Copper fire pits have a lustrous finish when new and add a touch of elegance to your outdoor setting. However, copper quickly discolors from weather and the heat and smoke of burning wood, so it will look old and worn after one or two uses. The green tint and tarnish can be polished from the outside, but the interior will become permanently discolored from soot and heat. Choosing copper fire pits with stainless steel bases and supports will prevent having to frequently replace conventional steel holders, which rust more quickly than stainless steel types. Since copper is a soft metal, regular maintenance and replacement of the screws, nuts, bolts and rivets on copper fire pits is necessary. Stainless steel is regular steel covered with a layer of chromium oxide and is a durable material ideal for cookware as it conducts heat well. Nonetheless, it does not hold up well to the high temperatures created by the flames of burning wood, which makes the coating unstable and exposes the metal underneath to oxidization and rust. Chromium oxide also deteriorates when it cools from the heat of fire. In addition to the body of the fire pit corroding, if the pit is not welded together, the fasteners that attach it to the base of the unit are susceptible to corrosion as well. If you find the drawbacks of copper and stainless steel fire pits unacceptable, consider fire pits made from other materials. Cast aluminum is a good fire pit material as it is lightweight and rust-proof and will not crack or warp. The exterior can easily be refurbished with heat-tolerant paint to keep it looking new for years. Sheet aluminum is an affordable fire pit option, but the pits are frequently assembled with flimsy fasteners and the thin aluminum of the fire pit body quickly wears thin and easily rusts. Sheet metal fire pits rust even quicker and often warp or melt if you build large, long-burning fires in them. Fire pits made from cast iron easily rust and require repeated painting and cleaning to keep them attractive, but their weight makes them a good option for unsupervised areas, as they are too heavy to easily move. Clay fire pits are delicate, prone to chipping and cracking and have to be slowly warmed and cooled. If you take your fire pit with you on camping or beach trips, choose a style that is easy to disassemble and not too heavy. Fire pits used as a focal point on a deck or in a backyard setting look most attractive if they are open on all sides, so bowl or dish styles are best. Fire pits used for grilling should have easily removable grids to easily transform them into fireplaces after cooking. If you plan to burn logs in your fire pit, make sure the interior is large enough to accommodate them. Can I Put Cast Iron in a Heated Oven?